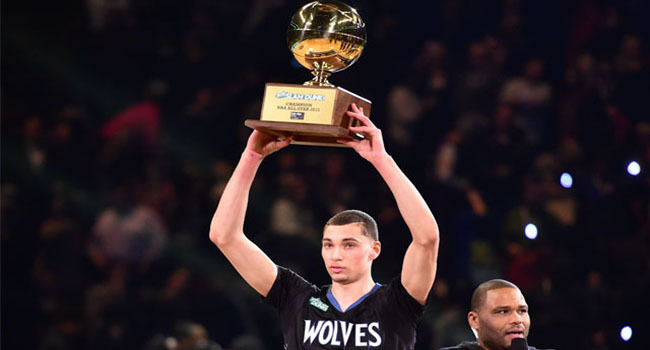 Zach LaVine is a worthy slam dunk champion but wouldn't it be nice if some actual stars participated? I’m not sure where you are on this Sunday in February but I hope you’re warmer than I am. It’s always a real eye-opener when you look at the digital readout on the counter and it says “minus.” Ya, that’s not good but let’s talk some sports. -I stopped watching the slam dunk competition a long time ago because it got stale and rarely did any of the game’s top stars actually participate. With that thought in mind I give you last night’s Slam Dunk Champion Zach LeVine of the Minnesota Timberwolves. I just watched his dunks and I admit, they were pretty darn spectacular. The problem is that most casual NBA fans have no clue who LeVine is. He averages about seven points per game. I’d rather watch LeBron take on Kevin Durant in H-O-R-S-E.
-The New York Jets yesterday decided not to extend running back Chris Johnson who now becomes a free agent. Johnson becomes just another one of those running backs who had a couple of big seasons and then petered out. -Major League Baseball is apparently toying with the idea of shrinking the strike zone for 2016. Since new MLB Commissioner Rob Manfred took over, he’s mentioned outlawing the defensive shift against pull hitters and now wants to make the already small strike zone even smaller. If you want more offense Mr. Commissioner then how about having umpires use the original strike zone? Then maybe hitters would be more apt to swing more often? If this man recruits your son, I'd look elsewhere. -By trade, most college football coaches are salesmen. They have to sell themselves, their school and their program in order to get the talent they desire. That said, if Louisville Head Coach Bobby Petrino ever sent so much as a post card to my son I’d send it back express with a big middle finger on it. Many high schools in South Carolina have now banned Petrino after he pulled a scholarship offer promised to a player. Yes, it’s a business, but it doesn’t have to include people like Petrino. Just look at the way he’s conducted himself wherever he’s been. -UFC President Dana White has a growing problem whether he is willing to admit it or not. More and more of his fighters are testing positive for everything from cocaine to performance-enhancing drugs. These aren’t his middle of the road fighters either. Guys like Jon Jones and Anderson Silva have tested positive after recent fights and White has to recognize that this isn’t a good look for his sport. -NBA Commissioner Adam Silver addressed the state of his sport yesterday and he touched on a couple of issues that I think fans will like. First of all, he wants to tweak the schedule to get players more rest and that includes cutting back on preseason games. He also appears to be open to altering playoff seeding as well but that may take awhile. My hope is that Silver also decides to cut back on regular season games period. There are too many games that are meaningless especially ones where the top players are getting rest. -I have no idea how the game of cricket is played in terms of rules but I can tell you that India defeated Pakistan in the 2015 Cricket World Cup. What I find most interesting is that these are two countries that politically, ethnically and religiously despise each other. Yet once again sports has shown that nations can get along for a little competition every once in awhile. National Signing Day has become a complete circus in my opinion. There was a time when yours truly was actually recruited to play football at the moderate D-1 level and basketball and baseball in the D-3 level. I’m not going to get into how long ago that was but lets just say the Buffalo Bills hadn’t lost a Super Bowl yet. I tell you this because I was fortunate enough to be in the presence of some guys who were recruited by the big boys in football and it was nothing like it is today. 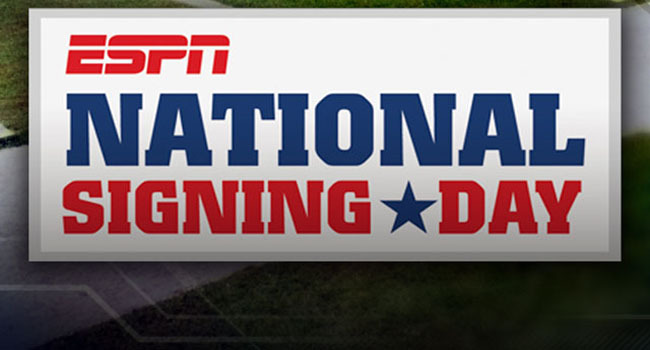 I’m not saying that this is bad, but if you would have told me that national signing day (NSD) would become a “national holiday” I would have told you that you were nuts. If you head over to the worldwide leader you’ll get an NSD bonanza that provides you with just about everything you need to know. You’ll get player rankings and team rankings and you’ll also get the schools that did the best job and those that did the worst. But wait! There’s more! You can also get the best fashions of NSD! Just what every college football fan wants right? Sorry but that’s where I have to draw the line. We are already putting enough pressure on these 17 and 18 year old kids but now we are going to critique what they are wearing when they sign on the dotted line? Let’s just end the shenanigans and call college football what it is; the National Football League Developmental League. Making matters worse are the full-grown adults who attack these same kids on social media. “You didn’t come to my school!?!? How dare you!” What makes this scenario even worse is that the vast majority of these “fans” aren’t even graduates of the schools they love so much. I’m not suggesting you have to be an alum of a school to root for it but perhaps it would help your case. Ya I probably sound like ‘grumpy old man’ but I really don’t care. It’s completely out of control and it isn’t going to get any better. Here's the stash Green Bay's Letroy Guion had when he was arrested. The National Football League’s 2014 season is officially over but the “excitement” of the second season is already underway. If you aren’t sure what the second season is, it has nothing to do with free agency or the combine or the draft. This is now the time where players who are no longer under the constant thumb of their teams start getting arrested and/or in trouble. The biggest name in trouble since Super Bowl XLIX ended was Hall of Famer Warren Sapp. The now ex-NFL Network analyst was arrested for soliciting two prostitutes and assault in Arizona. Also in recent days, Indianapolis linebacker D’Qwell Jackson was cited for simple assault when he got into an alteration with a pizza delivery man. You probably already know that Cleveland’s Josh Gordon has formally been suspended for all of next season for his repeated issues with drugs and alcohol. Perhaps least known name is the one with most surprising arrest. Green Bay defensive tackle Letroy Guion was picked up by police in Florida with over 350 grams of marijuana, a 9mm semi-automatic handgun and almost $200,000 in cash. Behavior like this is far from rare. Arrests of NFL players almost always spike in the days and weeks following the end of the season. Perhaps Commissioner Roger Goodell could take a few minutes from all that time he gives the media to address the situation. 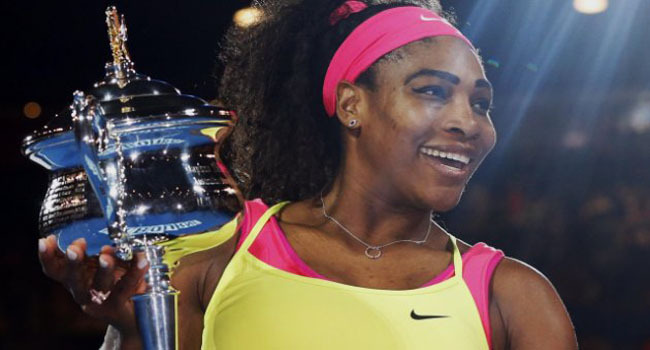 Serena Williams captured another grand slam and moved closer to Steffi Graf's career record. Super Bowl Sunday is upon us and I’m tackling a number of stories that have developed in recent days. -If you haven’t placed a wager yet on Super Bowl XLIX, then you may want to add a bit of research before doing so. So much action has been coming the Seahawks’ way that most Vegas sports books have moved the game to a “pick’em” selection. -Congrats to Serena Williams for her victory in the Australian Open. She is now three grand slam titles away from tying the great Steffi Graff. -If you ever needed further proof about just what kind of person NFL Commissioner Roger Goodell is then I give you his “State of the Game” Presser on Friday. CNN’s Rachel Nichols asked a very direct question related to the conflicts of interest regarding investigators the NFL has chosen to run its’ investigations. Goodell was clearly annoyed and couldn’t even look Nichols in the eye as he gave a condescending answer. He even badgered her at the end of the his diatribe. -My dreams of an unbeaten NCAA Championship Game in college basketball went out the window last night. Duke went into Charlottesville and knocked off second-ranked Virginia 69-63. Now I can only hope that Kentucky gets there unbeaten to give the game just a little more added flavor. Jerome Bettis was elected to the Pro Football Hall of Fame last night along with seven other worthy candidates. -Congratulations to the eight men selected to the Pro Football Hall of Fame yesterday. Junior Seau, Will Shields, Jerome Bettis, Tim Brown and Charles Haley were the modern-era selections. All in my opinion are worthy and should come with no debate whatsoever. Also elected were Mick Tingelhoff who was elected by the Seniors’ Committee and team executives Bill Polian and Ron Wolf. -This is one of the rare Hall of Fame classes that should come with no debate across the board. -UFC 183 saw Anderson Silva return from a 399-day layoff to defeat Nick Diaz in a unanimous decision. The bout was an odd one with Diaz taunting Silva throughout and even faking a knockdown at one point. Last we saw Silva, he suffered that horrible broken leg against Chris Weidman. At 39 years old, Silva is considering retirement but has announced nothing at this time. -Tiger Woods shot a career-worst 82 Friday and finished dead-last and missed the cut at the Phoenix Waste Management Open. 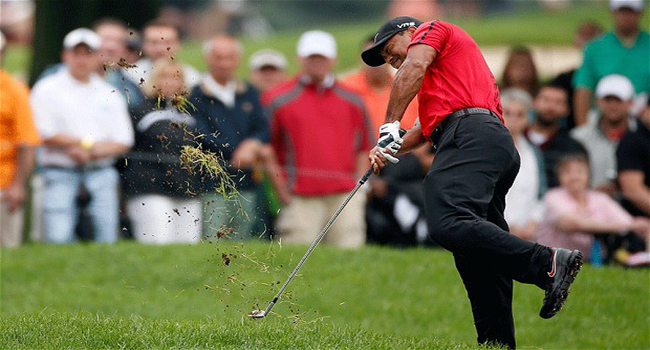 Heading into the tournament, Woods was very excited about his newly crafted swing and added length off the tee. To his credit, Woods didn’t give the typical excuses we’ve become used to after his poor rounds. He instead went with humor and even resorted to Marshawn Lynch’s “I’m just here so I won’t get fined” comment. -Speaking of golf, how can you not love the atmosphere around the 16th hole? Golf purists of course find it to be a disgrace to the game, but the arena style par three is fantastic for fans and makes great television. Are there people a bit out of control at the 16th? Of course, but then again this isn’t a major so let’s just take a deep breath and enjoy it. -Aaron Rodgers won his second Most Valuable Player Award last night and J.J. Watt became the first-ever defender to unanimously win the Defensive Player of the Year Award. I can’t argue too much with the selection of Rodgers but if Watt can’t win the MVP with the year he had then I don’t see a defender ever winning the award again. Watt wasn’t just a great defender though, he was a great player who probably deserved better. Twenty years from now I see soccer becoming the dominant sport in America like it or not. Welcome to 2035! Jump on board the time machine with me as I give you my thoughts on what sports in America will look like 20 years from now. The biggest change overall will be the rise of soccer. If you read my column regularly then you know this just destroys me but it’s what I see happening. 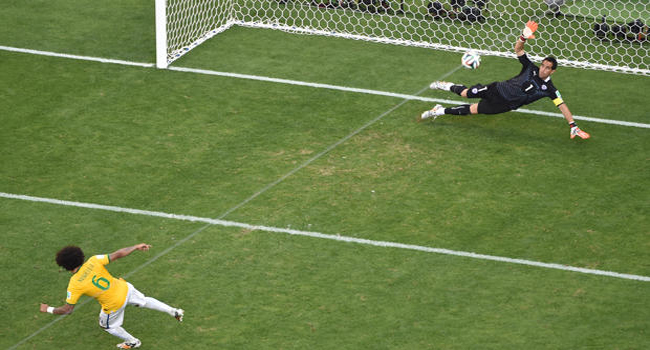 The world is a smaller place now because of technology and social media and the most recent World Cup proved just how crazy Americans are getting over soccer. The vast majority of the fan base right now is kids, teens and twenty-somethings with smatterings of older adults thrown in here and there. If you advance things 20 years, that means the current fan base will be a prime mixture of fans in their 20’s, 30’s and 40’s. Soccer has long been treated as a red-headed step-child in America but with the fear police assaulting football, I see it growing by leaps and bounds. Speaking of football, I have a gut feeling participation nationally will continue to drop as parents keep their kids from playing for health reasons. Far be it from me to tell any parent how to rule over their child but I believe much of what has happened to “make the game safer” has largely been blown out of proportion. I also believe that college football will actually become bigger than the National Football League. I feel this way because the NFL will continue to lose viewers. Recent polls have shown that men over 50 is the largest demographic that is no longer watching pro football. That speaks volumes because if they stop watching then their kids will become less interested as well. The pro game in general has become a shell of its’ former self with the violence of the game all but removed and defense becoming an after-thought as everything favors offenses today. If the NFL moves teams to Europe I also predict that will quicken the pace of its’ demise. The NBA will need to have more personalities twenty years from now as LeBron will be long gone from the court. My crystal ball sees the National Basketball Association staying popular but it faces some challenges. First and foremost the game must have personable stars that provide the face of the league. LeBron James is clearly that face today but Michael Jordan set the bar so high I wonder if it is unreachable. I have yet to see a player with Jordan’s ability to be an assassin on the court and be friendly off it has been unmatched. I also think the NBA will shorten its’ season. We are seeing a rise in star players spending more time on the bench for rest and for minor injuries. Fans will demand this going forward. Major League Baseball will continue to see Latin players flood the rosters. This is not a bad thing in any way. MLB’s biggest issues will be keeping the games as short as possible as well how to deal with pitching injuries that are on the rise. Don’t be surprised if MLB contracts a few teams in an effort to keep competitive balance high. I also see contraction in the National Hockey League where some teams just aren’t filling seats. The NHL will finally have some personalities and players that will draw fans in that haven’t normally been there in the past. The game itself is in good shape, but it will need to do more to draw in those fringe fans and I think it will once Gary Bettman is no longer the commissioner. Al in all, sports will continue to dominate our lives but I see changes coming and for me personally I’m not real crazy about them. 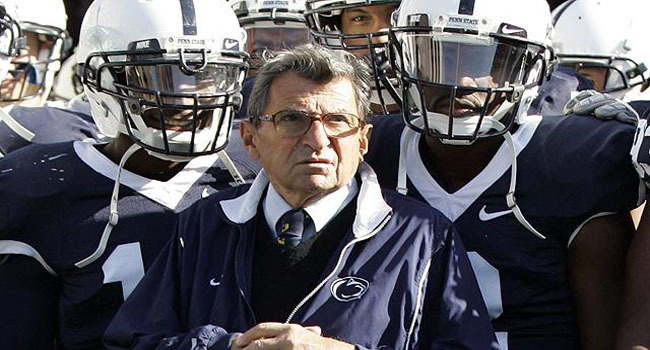 Joe Paterno had his 112 wins restored but in the end does it really matter? Ya know what? I don’t know every fact there is to know about what happened at Penn State University when Jerry Sandusky was there abusing children. In fact, there are very few among us who know everything but at least I’m willing to admit it. Yesterday, the NCAA, who completely botched the investigation from the start, restored 112 wins to the record of Joe Paterno. Those wins had been stripped from the school and Paterno as punishment for the Sandusky Child Sexual Abuse case. With the restoration of those wins, Paterno now has 409 career victories which once again makes him the leader in total wins among college football coaches. As you might imagine, there was great joy throughout Happy Valley when this announcement came down. Let me tell you exactly what I know. First, the NCAA screwed this whole thing up from the very beginning and once-again proved when there are criminal activities involved they need to step aside until the authorities can do their jobs. Secondly, there is no disputing that Jerry Sandusky sexually assaulted many children. Perhaps more than we’ll ever know. Jerry Sandusky is where is belongs but could he have been there sooner had Paterno used his power in the proper way? He used his power as a football coach to coerce and dominate over kids. He’s in prison where he belongs. Third, Joe Paterno did not do enough to end Sandusky’s reign of terror and there is no denying this. To say Paterno “did enough” when he contacted Athletic Director Tim Curley is laughable if only this were a laughable situation. Curley was a former Paterno player who had been positioned by Paterno himself to become the AD. To suggest that Curley was going to act without input from Paterno who was Penn State, is ridiculous. But let’s strip of all that away though. The culture of football being the horse the moves that cart at many universities is true, especially at Penn State but take all of that away for a second. A boss is told that one of his top assistants is committing horrible crimes and that boss then reports this to his own boss. Chain of command right? Once the boss did his job by telling his own superiors, his job was done right? This is the argument by those who have always defended Joe Paterno. He did his duty to report the witnessed crime to his superiors and then moved on to other things. In the world outside of college campuses where a football or basketball coach is a god, this is appropriate behavior. Unfortunately, Paterno abused his power by not using it. If you think for one minute that Paterno didn’t hold court over that university then your blind. This doesn’t mean that Joe Paterno was not a good man, a good coach and a father figure to many because he was and that shouldn’t be forgotten. The problem is that Paterno made one, awful choice. He chose to stand pat and let those “above him” handle a situation that he could have handled it himself. Paterno would have even added to his legacy if that were possible by choosing what’s right over loyalty and probably some disbelief. The wins restored are being celebrated as a justification of Paterno doing nothing wrong. This isn’t true. They have been restored because the NCAA couldn’t find its’ way out of a paper sack and screwed this thing up from day one. Lost in all of this is not how fans of the Nittany Lions are reacting to the restoration of 112 wins. What is lost is the regard for the victims who once again see themselves being shoved aside by the very same things that kept their stories from being revealed in the first place. 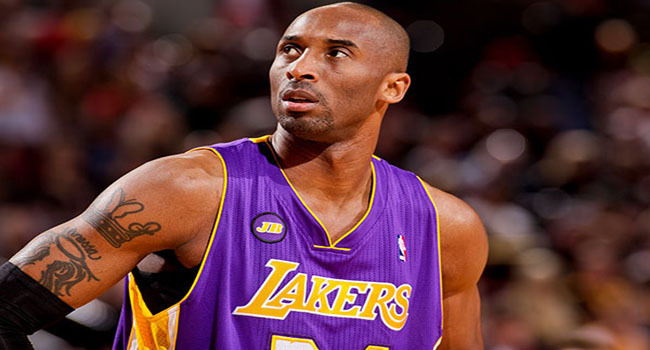 Kobe Bryant's comments about AAU basketball are accurate and need to be heard. How in the world do I settle on just one or two topics with so much going on? My bullets are back and it’s time to pull the trigger! -Kobe Bryant recently ripped on the AAU basketball program saying that European players are more skillful than are kids who come from the American feeder system. “Teach players the game at an early age and stop treating them like cash cows for everyone to profit off of,” he said. “That’s how you do that. You have to teach them the game. Give them instruction,” said Bryant. I could not agree more. -Rajon Rondo returned to Boston for the first time since being traded to Dallas. He tossed in 29 points in the Mavs’ 119-101 win over the Celtics. Chip Kelly has more control of his players in a shake-up in Philadelphia. -Following the Philadelphia Eagles’ late-season collapse, the team has re-structured the front office with Head Coach Chip Kelly gaining control of player personnel and General Manager Howie Roseman has been elevated to Executive Vice-President of Football Operations. Rarely do these situations work well when a coach is given so much power. Wonder if the team has an Assistant to the Traveling Secretary? -Speaking of the College Football Playoff I think there are a couple of important notes coming out of the first-ever semi-final games. The television numbers were outstanding for both games and I’ll get to the point on that in a second, but where the “powers that be” need to focus on is time. The Rose Bowl,which was a blowout, scored better ratings than the Sugar Bowl which was a highly competitive game. What this proves is that people just won’t stay up until 1am Eastern no matter how important or good the game. -The second part of the CFB Playoff scenario is that it’s popularity across the country means that playoff expansion is coming. I think we are about five or six years away from an expansion to eight teams but the TV numbers were just too good not to discuss it. The one issue here is where to play the games. The Rose Bowl had trouble filling seats and I think an argument could be made to play these games on campus in the first-round at least. -I had no idea former Buffalo Bills’ coach Doug Marrone was such a hot commodity. Days after opting out of his contract, he’s rumored to a favorite in several cities. His Bills took a step forward by going 9-7 this year behind an aggressive defense but the offense was really flat. Not sure what the draw is here. -For all the dislike of Jameis Winston because of his off-field problems and immaturity, my concern about his potential pro career is his pocket presence and long delivery. Seems to me that he gets very discombobulated in the pocket when there’s any significant pressure and his throwing motion is not what I’d call “quick and efficient.” Almost reminds me of Byron Leftwich. -One note on the National Hockey League’s Winter Classic… I think the NHL has to consider moving the game for two reasons. Number one is that it can’t compete if college football continues its’ playoff semi-finals on the same day. Also, the NHL should re-consider the start time as well to get a more optimum viewing audience. I love the Winter Classic but the NHL has to do a better job of making its’ stars available at better times. The first ever College Football Playoff had its opening games on January 1 with the Oregon Ducks routing the Florida State Seminoles, and the Ohio State Buckeyes outscoring the Alabama Crimson Tide. The final for the national championship will be played on January 12 and Oregon has opened on Bovada and topbet as a 7-point favorite. After the spread was posted, the Ducks were quickly bet up on betonline and sportsbook.com to -7.5 points and it looks to go even higher. The moneyline has Oregon at -290 and Ohio State at +245, while the over/under point total opened with 70.5, but was bet up quickly to 73.5. 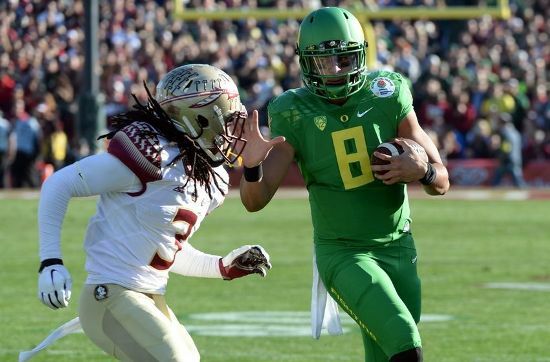 Oregon reached the national championship game with is rout of 59-20 over FSU on Thursday in the Rose Bowl. Oregon, led by quarterback Marcus Mariota, the 2014 Heisman Trophy winner, is 9-0 ATS in its past 9 games overall. This will be the third consecutive game that Ohio State has been an underdog. The Buckeyes were an underdog against Wisconsin for the Big 10 championship and to Alabama in Thursday’s Sugar Bowl. Ohio State routed the Badgers and upset Alabama 42-35 behind Cardale Jones its third string quarterback. Urban Meyer the Ohio State head coach was startled when he heard that Oregon had won by 39 points. He quickly left the news conference in jest after hearing of Oregon’s routs saying they need to get going to prepare for the Ducks. Both Ohio State and Oregon were amongst the favorites during the preseason to win the inaugural College Football Playoff. Oregon lost to Arizona October 2, but won 9 straight to reach this point, for the second time in the past 4 seasons. Oregon was beaten by Auburn 22-19 in the 2011 National Championship game. Ohio State lost to the Virginia Tech Hokies at home on September 6 as underdogs by 10 points. The loss was just one of numerous roadblocks Meyer’s team was able to overcome to make it to the championship game. This past August, Braxton Miller the starting quarterback was lost for the entire season with an injury to his shoulder. The odds on many futures boards dropped for Ohio State to 50 to 1 after Miller was hurt. Money continued flowing in on Ohio State. In fact, more bets at season’s end had been placed on the Buckeyes winning the national championship that with any other team. 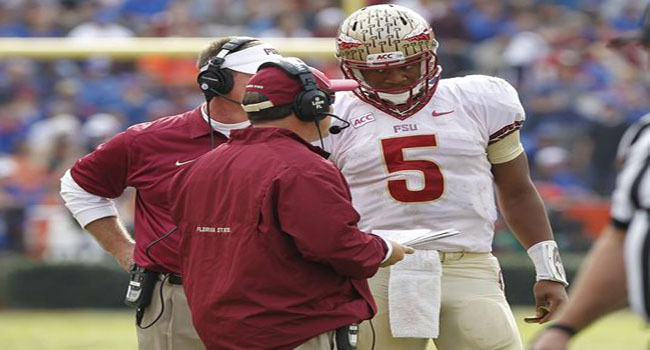 Even though Florida State ended its season 13-1 SU the Seminoles were just 3-11 ATS. Alabama was just 4-9-1 ATS this past season. The line will move up and down for the next 10 days until kickoff of the national championship game. Early betting however shows great support for the Oregon Ducks. My Winners for Today’s Semifinal Games and More. A win in the Rose Bowl would make Jameis Winston's career record at Florida State 28-0. Normally a piece like this would be featured in the research area of the website but I’m “blogging” it today because I just have to break down these New Year’s Day games. Florida State (+8) vs Oregon (O/U 71) – Despite being the only unbeaten team left in college football, the Seminoles are the three-seed in the first-ever college football playoff. Frankly, there’s a couple of reasons for that and those are the relatively weak schedule and the constant need to come from behind against much of that competition. The Ducks are out to prove a couple of things; first, that they aren’t a finesse team and second, that their Heisman winning QB is better than Florida State’s. While may will make this a game between Marcus Mariota and Jameis Winston, I believe the defenses will play a significant role in who advances to the title game. FSU has struggled defensively compared to last year and that’s giving lots of people reason to lay their money on the Ducks but there is one major concern I have here. Oregon struggles to score touchdowns in the red zone because they tend to go east and west more than north and south and they run out of room near the end zone. Offensive coordinator Scott Frost will need to make proper adjustments there. Trends: The Ducks are 5-0 straight up in their last five games… Florida State is 1-4 against the spread in their last five games…The total has gone UNDER in four of FSU’s last five games. The Pick: As badly as I want to take FSU here because of their penchant for comebacks this season, I have a feeling the Ducks are going to run them out of the building with an offensive pace they haven’t seen all year. Take the Ducks to cover and take the OVER. The Buckeyes' fortunes will rise or fall behind QB Cardale Jones tonight. Ohio State (+9) vs Alabama (O/U 58) – Ohio State comes to New Orleans with a team led by a quarterback who has started just one game in his career. Granted, Cardale Jones tore up Wisconsin in the Big Ten Title game 59-0, but he’ll face a much greater challenge in terms of both defensive talent and defensive coaching from Alabama. The Tide under Nick Saban have always been a run-first team but behind new offensive coordinator Lane Kiffin, the offense has exploded. The key will be whether the Alabama offensive line can handle a very good defensive line from Ohio State. If the Crimson Tide control the line of scrimmage then it could be a long day for the OSU defense. Trends: Alabama is 4-10-1 against the spread in their last 15 games… Ohio State is 5-0 straight up in their last five games… The total has gone OVER in 11 of OSU’s last 12 games… The Crimson Tide is 5-0 in its’ last five contests. The Pick: With six national titles between the two of the them, Saban and Urban Meyer will have their teams ready to play. I think Bama wins but I like the Buckeyes getting the points and I like the OVER as well. Wisconsin (+7) vs Auburn – Take the Tigers to cover as the Badgers are in a bit of disarray right now. Michigan State (+3) vs Baylor – I can’t get Sparty’s second half collapse against Oregon’s high-octane offense out of my head. Take the Bears to cover. Minnesota (+5) vs Missouri – Are you sensing a trend? Every Big Ten team playing today is an underdog. With good reason too, take the Tigers to cover. Jim Harbaugh is the next head coach at Michigan but how long will he stay? University of Michigan Interim Athletic Director Jim Hackett made it very clear in the days following the firing of Brady Hoke; having a “Michigan man” was no longer a top priority. There was always an exception to that rule and his name was Jim Harbaugh. 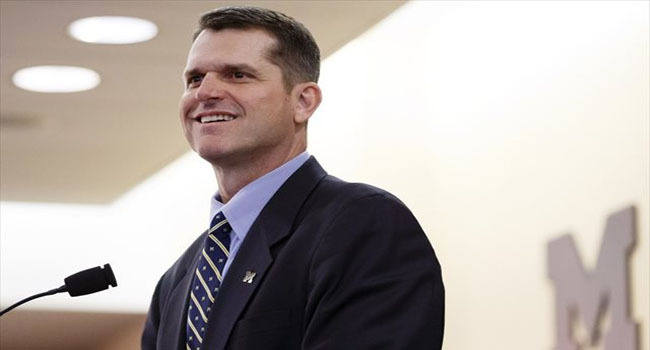 Yesterday, Harbaugh became the 20th head football coach of the Wolverines. There is no one more “Michigan man” than Harbaugh who started at quarterback from 1984-1986 for the Bo Schembechler -led teams who were so successful. I must admit I’m surprised Harbaugh spurned the National Football League and especially for less money than what he could have gotten from just about any of those teams. I think that two things played a major factor in his decision however. Number one is that of the available NFL jobs, none had a quarterback that Harbaugh really wanted to work with and that’s vitally important for the old QB because as we know he can flat-out coach quarterbacks (see Andrew Luck). The Raiders and Jets both have young signal-callers but neither was enticing enough for Harbaugh. The argument could be made that both Atlanta and Chicago have good, veteran quarterbacks in Matt Ryan and Jay Cutler but each have their issues. The second reason Harbaugh chose to leave the NFL is because I really feel he was tired of seeing what was happening to his alma mater an the call to come home and fix it was too great. Michigan fans will once again pack the seats at Michigan Stadium to see the prodigal son return and he will make the program prominent once again but I caution them this; the desire to win a Super Bowl never leaves you as a player or coach if you’ve had a taste of it and Harbaugh has. I believe his stint in Ann Arbor will be five years or less because that desire will be too strong to avoid. The OU faithful are starting to wonder what's going on with Bob Stoops. -What on Earth has happened to Bob Stoops and Oklahoma? They were a preseason top five team who ended up finishing with five losses following a humiliating 40-6 loss to Clemson in the Russell Athletic Bowl. That score wasn’t indicative of how poorly Oklahoma played either. It was 40-0 after three quarters and Clemson pretty much emptied the bench in the final stanza. I have a feeling Stoops falls into that category of having been in the same place too long. -I could be way off base here, but I think the Pac-12’s success in these early bowl games is a sign that Florida State better strap it up tomorrow when they face Oregon in the Rose Bowl. After Stanford’s 45-21 drubbing of Maryland last night in the Foster Farms Bowl, the Pac-12 moved to 4-0 in bowl season making them the only unbeaten conference remaining. Let’s face it – the level of competition between the ACC and Pac-12 wasn’t really a discussion topic anyway was it? -As if I needed any more proof for my personal war against instant replay reviews in football I give you the LSU-Notre Dame game. Mad Hatter Les Miles went for a fake field goal and replays clearly showed the ball breaking the plane of the goal line but officials concluded it was disputable because of where the knee was. Here’s the thing, if the knee was down the play is over based on where the ball is when the knee touches right? The ball was over the goal line. If you can’t get replay right that you shouldn’t use it. -Have a great New Year’s Eve and be safe people. Maybe my Christmas wish will come true and Tiger will actually just admit he played poorly for once. First of all, Merry Christmas to everyone! Hope your day is filled with all kinds of good food, family and fun. Today I’m giving you some Christmas wishes for any number of teams and athletes. for Tony Romo to get at least one playoff win. for Michigan to land a head football coach who wants to be there. for Roger Goodell to resign. for ESPN to cancel First Take and no longer allow Stephen A Smith and Skip Bayless on television. for Tiger Woods to walk off the course just one time and say, “I played like crap” rather than blame it on everything else. for the Kansas City Royals not to be one-hit wonders. for college football to immediately move to an eight-game playoff. for high school athletes to enjoy being “high school athletes” and not be forced to specialize by club sports. for ‘Mike and Mike’ to use more of my tweets. for the National Basketball Association to become interesting again. for Coach K to get one more title before he hangs up the whistle. for soccer to go back to being a world sport and not an American one. for Marshawn Lynch to actually give a decent interview after a game. for Steelers’ Coach Mike Tomlin to drop a few of his cliches. for MMQB’s Peter King to finally admit he’s just a shill for the NFL. Thanks Ed O'Bannon for ruining my family's favorite video game! for the NCAA and EA Sports to find a way get the NCAA Football video game back for us. for NFL people stop using the word “elite” when it comes to quarterbacks. for Antonio Brown to go up against Richard Sherman in the Super Bowl. for Peter Edward Rose to be inducted into the Baseball Hall of Fame. for all of us to just admit that college football and basketball is nothing more than a minor league for the pros. for Mike Emrick to call every game in every sport for the rest of his life. to never see another pro athlete charged with domestic violence. for the Super Bowl to be a national holiday and everyone gets the next day off. for the Atlanta Hawks to the NBA Title. for the Detroit Tigers to win a World Series before owner Mike Ilitch dies. No one has been more important to Detroit sports than he has. for group celebrations to be allowed after NFL touchdowns. for a “Gretzky-like” figure to reappear in the National Hockey League. for the Cleveland Cavaliers to lose in the NBA Finals. Let’s face it; it makes for more interesting sports talk. for the Lakers and Celtics to continue being irrelevant. for defensive backs so they can actually play defense again. for Jerry Jones’ plastic surgeon who must be tired of seeing him walk through the door. for Larry Fitzgerald to get a Super Bowl title before he retires. for Al Michaels to narrate my life. for someone in a Santa suit today at an NBA game to do something ridiculous. for officials at all levels and in all sports to remember it isn’t about them, it’s about the game. for Oregon to settle on a uniform or 50.
for Devon Still’s daughter to make a complete recovery. for karma to show up at Jameis Winston’s door. for the NFL Playoffs to be as great as ever. for your favorite teams to do as well as they can!